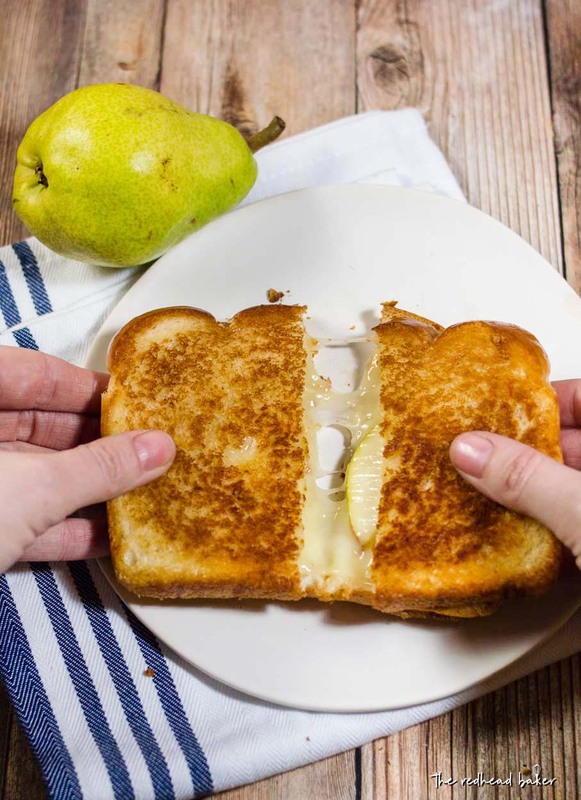 This gourmet grilled cheese sandwich with taleggio cheese and thin slices of pear is the perfect way to celebrate National Grilled Cheese Month! April is National Grilled Cheese Month! Yes, a whole month dedicated to that delicious sandwich full of gooey, melty cheese. And a group of us bloggers decided to get together to share some grilled cheese recipes. Not that grilled cheese really needs a whole recipe. I mean, you butter bread, you put some cheese between it, and pan-fry it until the bread is toasted and the cheese melts. It’s like asking for a recipe for buttered noodles. But there are some tips and tricks to great grilled cheese, and there are endless filling possibilities. 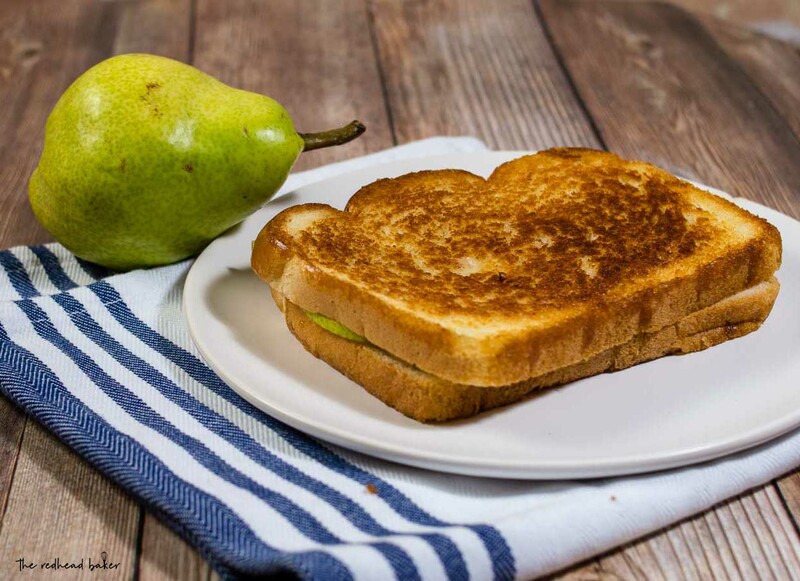 Grilled cheese can be so much more than just melted American “cheese” between two slices of white bread. You can use any great melting cheese, add meat, fruit, veggies, condiments … You could eat grilled cheese for a month and never have the same sandwich twice. For this sandwich, I used an Italian soft cheese called taleggio. It’s made from cow’s milk, and dates back to the time of Cicero and Cato the Elder of ancient Roman times. It’s a washed-rind cheese, which means the outer shell is bathed in brine as the cheese ages. Most of the time, this means that the rind can be eaten, though in some varieties of cheese, the flavor of the rind becomes too overpowering. Personally, I’m not a fan of the flavor of the rind, so I remove it. 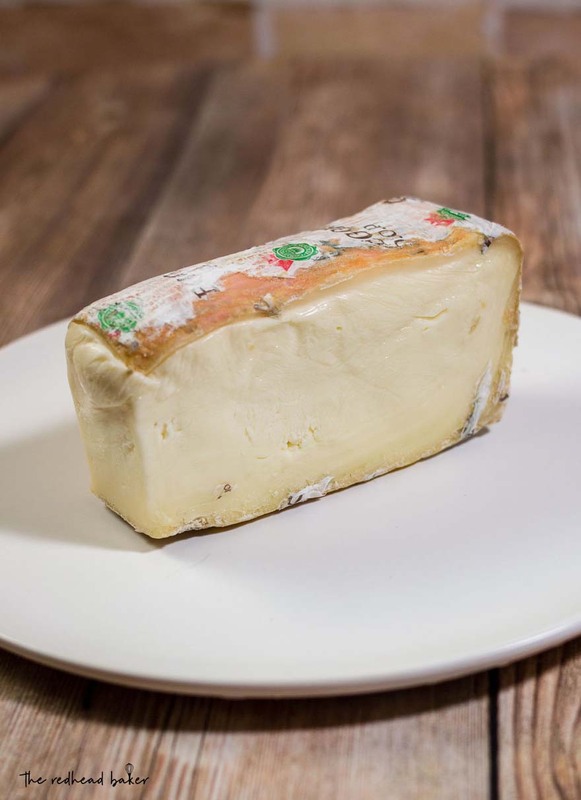 The gooey cheese interior of taleggio is quite mild in flavor with subtle fruity tang, and pairs particularly well with figs and pears. If you like brie, you’ll probably like taleggio. 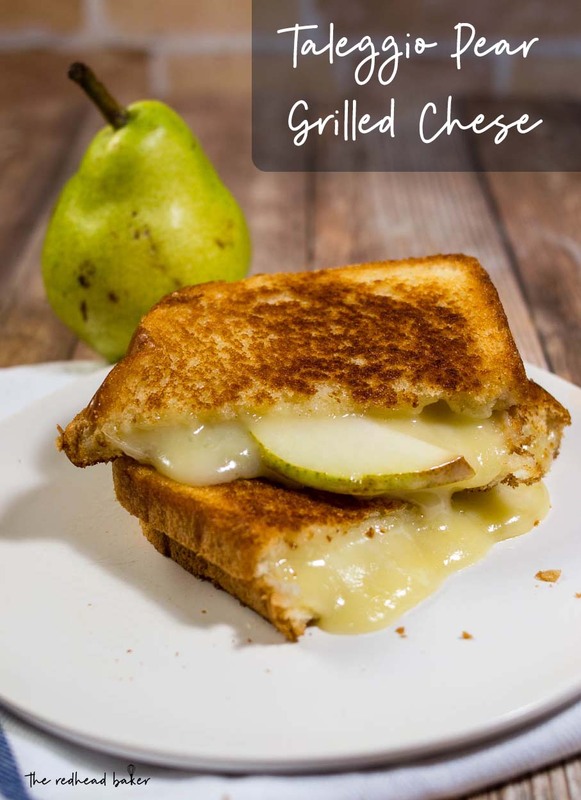 It melts very well, so it’s ideal for applications such as grilled cheese, macaroni and cheese, and other recipes where the cheese is melted. Sliced the pear as thin as possible. This will allow the heat from the pan and the melting cheese to slightly soften it, without having to cook it separately before adding it to the sandwich. I used my OXO mandolin, but you can use a paring knife as well. Spread a thin layer of butter on one side of each slice of bread. Preheat the skillet over medium-low heat. Spray with nonstick spray. Place two slices of bread, butter-side down, in the skillet. Layer one quarter of the cheese onto each slice of bread. 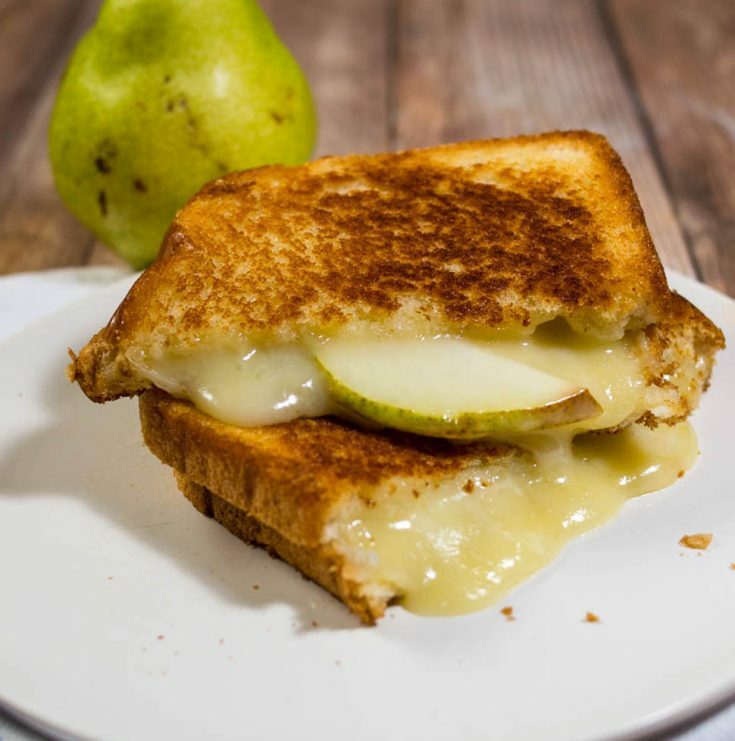 Divide the pear slices between the two slices of bread, and layer a quarter of the cheese on top of the pear slices. Top with with the other slices of bread, butter-side up. When the bottom is golden brown, carefully flip the sandwiches over and cook another few minutes until the second side is golden brown. Place each sandwich on a plate. Cut in half, and serve.